These tactical laser tag inflatables are 100% portable. They are built tough by Coleman who have 100 years of experience making equipment for the outdoors. The inflatables are rain-resistant and ready for battle! They come in a standard black/dark grey color. 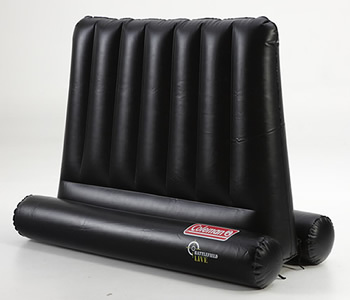 These inflatables feature the patented double lock air-value. The bunkers are dark grey and are approx 6kg (13lbs) each. They only take a couple of minutes to inflate. Ask about the matching Coleman Air-Blowers. The Bunkers are 1.6m x 1.2m x 0.8m each or 5¼ft x 4ft x 2¾ft.